Stun guns use high voltage and low amperage to temporarily disable an attacker for several minutes. The stun gun does not rely on pain for results. The energy stored in the gun is dumped into the attacker’s muscles causing them to do a great deal of work rapidly. This rapid work cycle instantly depletes the attacker’s blood sugar by converting it to lactic acid. In short, he is unable to produce energy for his muscles, and his body is unable to function properly. The stun gun also interrupts the tiny neurological impulses that control and direct voluntary muscle movement. When the attacker’s neurological and muscular system is overwhelmed and controlled by the stun gun, he loses his balance. Should the attacker be touching you, the current will not pass to your body! Never use a stun device at a gas station or near fuel, gas or fumes. Check your local state and county stun gun laws/restrictions. It's like having two stun guns in one. TWICE the contact -- totaling 1.2 Million Volts -- TWICE the stopping power! The Double Trouble stun gun is more effective than most stun guns because of the space between the contacts. The greater the space, the greater the effect. Most stun guns only have 1.5 inches. The Double Trouble has 5 inches between contacts. Also comes with a hand strap and FREE Nylon Carrying Case with Belt Clip. It's a 950,000 volt stun gun designed to give you a punch with POWER. Just touch your attacker to instantly repel them and it will give you time to get away. Longer contact will cause further disorientation and after some seconds may drop them to their knees. Uses 2 Lithium batteries (included). Comes with a free nylon belt holster designed to allow quick access and deployment of this amazing stun weapon. This patented device has a soft rubber skin and is sized to accommodate all hand sizes. A safety switch is built in and accessible to your thumb. 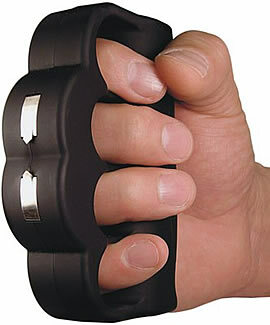 Once you grab the Knuckle Blaster stun gun you can flip off the safety and fire with the same hand. No need to use two hands. 4 5/16" x 3 1/4" x 1 1/8"
Energizer Eveready Batteries are used. You do not have to purchase them from us, but you do have to use them.